CARMEL, Calif. – July 21, 2017 – Three of the world’s most iconic Jazz and Blues artists and a trio of cool cars will be celebrated in paintings by Stanley Rose at the Automotive Fine Arts Society (AFAS) exhibit during the Pebble Beach Concours d’Elegance, on Aug. 20, 2017, in Carmel, California. Among the artists in Rose’s paintings are American Jazz trumpeter, Chet Baker; Blues guitarist and singer, Eric Clapton; and the “King of Blues”, BB King. This is the 22nd year that Lincoln Motor Company will sponsor the AFAS at the Pebble Beach Concours d’Elegance. 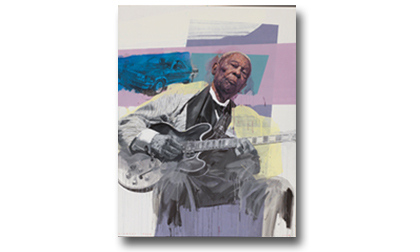 This is the first time that the paintings will be exhibited and are part of Rose’s series, Bluesmen and Their Cars. “BB’s Chevrolet El Camino” is a 58-inch by 45-inch oil on canvas that features the music pioneer seated in the foreground strumming his guitar next to his ’84 model Chevy. The El Camino today sits in the Tupelo Automobile Museum next to King’s 1978 Rolls Royce Silver Ghost. The second in the series is a 58-inch by 45-inch oil on canvas of modern-day Blues guitarist Eric Clapton with his vintage V12 powered Ferrari in a piece entitled “Eric’s Ferrari 250GT SWB.” In “Chet’s Chevy”, a 58-inch by 45-inch oil on canvas, the legendary Jazz trumpeter, Baker, is shown with a vintage bowling sign proclaiming his name and a front three-quarter view of a 1950s era Chevrolet. British fine artist Stanley Rose is the expert of unusual. Creating combinations of subjects in his paintings never explored by other artists, Rose is never afraid to branch out from tradition. Rose began his journey as an artist after he obtained a degree in Fine Art Painting and taught art for a number of years before becoming a full time automotive artist. His work is defined by his large canvases usually associating figures in vintage clothing with classic cars. In 1984, Rose moved to France to paint full-time, allowing the relationship between man and automobile to be his inspiration. Rose established his studio aboard a Dutch barge in the heart of Burgundy but subsequently moved to a 14th century chateau that houses a collection of cars. He started exhibiting throughout Europe in 1988, was welcomed as a member into the Automotive Fine Arts Society in 1999; he regularly exhibits at Pebble Beach. Earning an array of awards, Rose received the Lincoln Award in 2002 and 2008, the Peter Helck award in 2001, 2008 and 2015, as well as rewards of excellence on six occasions. He continues to live in France with his wife Avril. To learn more about Stanley Rose and his work, visit www.stanley-rose.com.